(New Britain, Conn., July 6, 2018) – New Britain Bees team officials have announced that seven members of the team have been selected to participate in the 2018 Atlantic League All-Star Game. 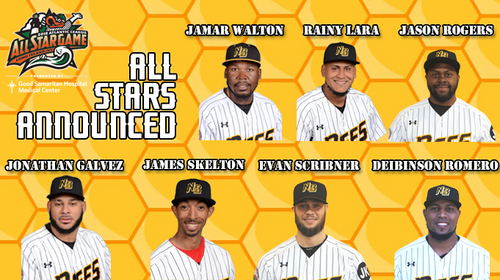 Infielders Deibinson Romero and Jason Rogers, outfielders Jamar Walton and Jonathan Galvez, catcher James Skelton, and pitchers Evan Scribner and Rainy Lara will represent the Bees on the Liberty Division team. To see the full Atlantic League All-Star roster, CLICK HERE. Romero is currently in his first season the Bees and ranks second in the Atlantic League in games played (59), third in hits (67), doubles (15), extra-base hits (23) and total bases (106), fourth in at-bats (228), sixth in RBI (35), seventh in home runs (8). He also has a .294 batting average with 33 runs scored. Rogers, in his first season in the Hardware City, is currently batting .331 (fourth in the Atlantic League) with 14 doubles, two home runs, 35 RBI, 26 runs scored, and a .423 on-base percentage (second in the Atlantic League). Walton, who is currently in his second season with the Bees and fifth in the Atlantic League, receives his third All-Star selection, with his other two appearances coming in 2015 and 2016 as a member of the Southern Maryland Blue Crabs. In 48 games this year, he owns a .292 batting average with seven home runs, 10 doubles, 30 RBI, 22 runs scored, and a .488 slugging percentage (fourth in the Atlantic League). Galvez is in his first season with New Britain and fourth in the Atlantic League. This is his second All-Star nomination, with his first coming in 2016 with the Bridgeport Bluefish. In 50 games with the Bees, he owns a .272 batting average with five home runs, five doubles, 13 RBI, and 15 runs scored. Skelton, who is in his third year with New Britain and sixth in the Atlantic League, gets named to his second All-Star team, with his first coming in 2015 with the Somerset Patriots. In 51 games, the backstop has compiled a .250 batting average with 10 doubles, one home run, 18 RBI, 25 runs scored, a .370 on-base percentage, and has drawn 29 walks (sixth in the Atlantic League). Scribner is currently in his first season with the Bees during his Atlantic League debut. In 16 appearances, the closer owns a 1-0 record with a 1.04 ERA, 16 strikeouts, and nine saves (fourth in the Atlantic League) in 17.1 innings pitched. Lara, in his first year with New Britain and second in the Atlantic League, receives his second All-Star nod, after his first came with the Bridgeport Bluefish in 2017. He has appeared in 12 games (10 starts) for the Bees, compiling a 3.43 ERA with 40 strikeouts over the course of 60.1 innings of work. Romero, Rogers, Walton, Galvez, Skelton, Scribner, and Lara will represent the Bees on the Atlantic League Liberty Division squad managed by Long Island skipper Kevin Baez at the 2018 All-Star Game, which takes place Wednesday, July 11 at Bethpage Ballpark, home of the Long Island Ducks, in Central Islip, NY.